The Muslim Times’ Response to an Anti-Islam Film – For Christians, To be Born Again in Islam! By the Grace of Allah, I had the opportunity to invite the Muslim Times Editorial team of 60 members and all the thousands of readers, on September 18th, to facilitate a dialogue and discussion regarding limits of free speech in our Global village‏. We need to use laws against Holocaust denial and hate speech, as examples to initiate an open and honest debate about the freedom of free speech and its limits! These existing laws should be used as template and precedence against anti-Islam vitriolic, to minimize exploitation of religious sensibilities. We have large amount of materials about laws against hate speech and holocaust denial in Wikipedia and those materials have been made available in the Muslim Times as well. Bear in mind that God has informed me time and again about the coming of earthquakes. So be sure that just as there have been earthquakes in America and in Europe, in keeping with the prophecies, so will they occur in different parts of Asia, and some of them will be as terrifying as doomsday. There will be death on such a large scale that rivers will run with blood, and even birds and animals will not escape it. Such destruction will overtake the earth as has not happened since man was born. Most places will be turned upside down as if they had never been inhabited. There will also be other terrible afflictions, both in heaven and earth, and every sensible person will realize that they are no ordinary phenomena, and no trace of them will be found in books of astronomy or philosophy. Then people will be seized by anxiety and they will wonder what is going to happen? Many will be saved, and many will perish. Those days are near, indeed they are at the door, when the world shall witness a spectacle of doomsday. Not only will there be earthquakes, but other terrible calamities will also appear, some from heaven and some from the earth. This will happen because men have given up the worship of their God, and all their thoughts and their designs and their resolves are diverted towards the world. Had I not come, these calamities might have been delayed for a while, but with my coming the secret designs of God’s wrath, that had long been hidden, have been manifested. As God said: ‘…We never punish until We have sent a Messenger.’ (17: 16). 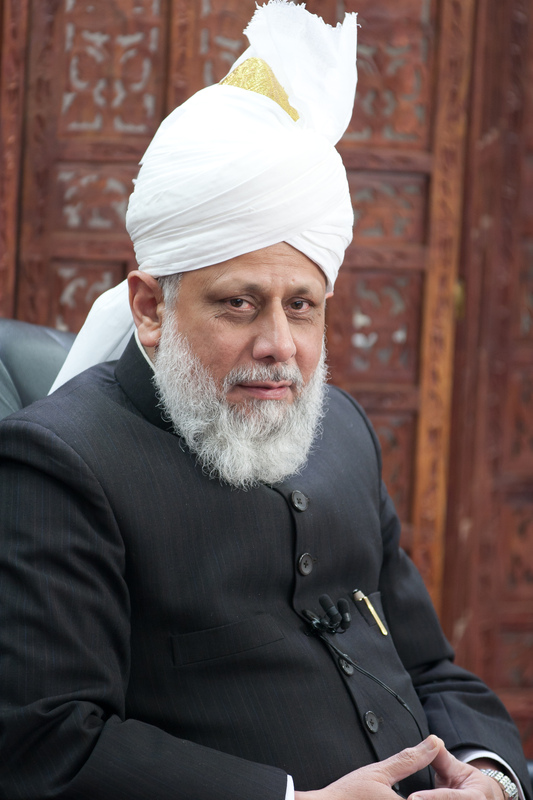 In the end Khalifatul Masih V prayed for the world in the words, “May God give sense to the world and may He enable us to discharge our responsibilities.” To listen to the whole of his Friday Sermon, click here. In the last few days, since the tragic and unfortunate murder of the USA Ambassador to Libya, the Muslim Times has published several articles to lay a positive response to the abuse of freedom of speech, which many Islamophobes find it very convenient to indulge in these days, in one form or another. The Muslim Times wants to make a special mention of the condemnation of the anti-Islam movie by President Barack Obama and Secretary of State, Hilary Clinton. We have not yet seen similar gesture from Presidential candidate Mitt Romney. The Muslim Times is specially thankful to Jürgen Todenhöfer for his efforts in this regard. Todenhöfer (born 12 November 1940 in Offenburg) is a German executive, author and former politician. He became a member of the Christian Democratic Union of Germany (CDU) in 1970 and was a member of the German parliament from December 13, 1972, to December 20, 1990, (five election periods). He also acted as party spokesman for development policy and arms control. In 1980 he visited Soviet-occupied Afghanistan and started to raise money for refugees. Todenhöfer is one of the most prominent German critics of the US-led wars against Afghanistan and against Iraq starting in the years 2001 and 2003, respectively. Till 2008 he has been vice chairman of the executive board at German media company Hubert Burda Media. To read further about his efforts in this regard, click here. A Beautiful Book to Introduce Islam to the non-Muslims!